The canine carnage continued in the northern Rockies this fall: As this issue went to press, more than 180 wolves had been killed in Montana and Idaho, eight of them just outside the border of Yellowstone National Park, leaving state officials admitting they may have gotten their hunting plans wrong. At press time, Defenders of Wildlife and 12 other conservation groups were still awaiting a decision by a federal judge in Montana in their case to reinstate federal protections for the wolves. The groups say the U.S. Fish and Wildlife Service violated federal law when it delisted wolves in the northern Rockies, removing safeguards under the Endangered Species Act and paving the way for state wolf hunts. Idaho set a quota of 220 wolves for this year's hunt, which was extended into March. Montana's limit was 75. Conservationists say allowing that many wolves to be killed threatens continued wolf recovery. Some 150 or more of the animals already die each year from illegal killings, lethal control and natural deaths. Wolf opponents argue that hunting is a way to reduce wolf attacks on livestock. Yet, in Montana, many of the killed wolves came from a small wilderness area along the northern border of Yellowstone where there is no livestock grazing, and at least four were from Yellowstone's Cottonwood Pack, including the group's alpha female. "Idaho hosts the core of the region's wolf population, with approximately 1,000 wolves," says Suzanne Stone, Defenders' northern Rockies representative. "By wiping out 220 wolves, the state is taking the first step toward crippling the regional wolf population by isolating wolves into disconnected subgroups. This could put the wolves at risk for genetic inbreeding and disease outbreaks and reduce the important ecological niche that wolves fill on the land." Idaho's state wildlife agency has announced its intent to reduce the state's population by half to 518 wolves. The state legislature has gone a step further, taking the stance that all wolves should be removed from the state "by whatever means necessary." "No other endangered species has ever been delisted at such a low population level and then immediately hunted to even lower unsustainable levels," Stone adds. "This clearly is not responsible wolf management." Wolves numbered more than 1,600 when Interior Secretary Ken Salazar adopted the Bush administration rule to remove the animals from Endangered Species Act protections last spring. 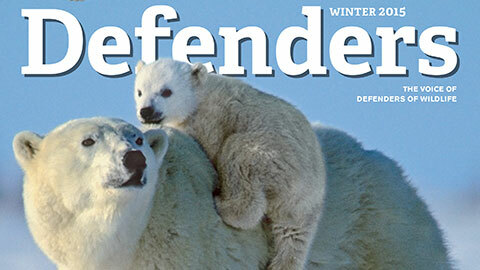 Defenders immediately challenged the delisting, charging that the federal government failed to fully consider the scientific inadequacies of the plan. Click here for up-to-date information on northern Rockies wolves.